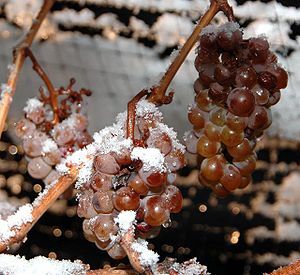 Ice wine or “Eiswein” originated in Franconia, Germany in 1794. Grapes were left on the vines until the first deep frost, and the freeze/thaw cycles that occurred concentrated both the sugars and flavors of the grapes. This wine is a very rare treat! It should be savored and appreciated and never gulped down in a hurry. It is an ultra sweet after dinner sipper and is best served chilled. Since the grapes are picked and processed before they are thawed out, frozen water and highly concentrated sugar and acid is squeezed out. The result is a sweet, fruity dessert wine. Yummy! The grapes have to be naturally frozen. They are picked in the very early morning hours just after the first frost hits. The grapes can’t be placed in a freezer to make this wine. If this inferior method is used, the wine must have a different name. Legend has it, the owner of a German vineyard was out of town when he should have been home harvesting his grapes. Upon his return, he and his staff decided to pick and process the grapes anyway. The result was ice wine. Today, these wines are highly prized drinks that are created in Germany, Austria, British Columbia and Canada. They are known for producing the best available since they have such consistent cold weather. Other countries, including the United States, produce this wine as well. Because the process is so time consuming, it can be very expensive and comes in small bottles. The wine ends up a golden color, or deep, rich amber. There is often a nutty smell to it and the flavors include peach, melon, apricot, mango or other sweet fruits. It often takes an entire vine to make only one single bottle. That’s why it can be so expensive and is often sold in half-bottles. This wine is typically made of Vidal and Riesling grapes. After the long harvest process, the grapes go through weeks of fermentation, followed by a few months of barrel aging. If you’ve got a sweet tooth, and enjoy having dessert, give it a try. The two go very well together. It’s delish!